Most customer questions are answered on this page. After reviewing the detail below, if you still need to ask us a question, our contact information is at the end of the FAQ section. 1. How do I order a bracelet? You can order either by mail or electronically. If you are mailing your order to our office, put at least one bracelet in your Shopping Cart and proceed to Checkout. Then click on Download PDF Order Form. Fill out the form, enclose a check for the amount due and mail your order to Circle of Hope Bracelets. For electronic orders, select the bracelets for your Shopping Cart and then proceed to Checkout. Sorry, we only accept electronic orders online or written orders through the mail. 4. How long does it take to receive my bracelets? 5. How much of the cost is tax deductible? No portion of your purchase is tax deductible. Because you are buying merchandise at fair market value, the IRS does not allow you to take any portion of the purchase price for a tax deduction. 6. Can I have a bracelet sent to a friend? 7. Can I make a contribution on someone’s behalf? Yes, just let us know that your check is a donation and tell us the name of the person for whom you are making the contribution. We will write an acknowledgement letter if you provide the name and address of the person to receive acknowledgement. 8. Can I have a bracelet made-to-order? Sorry, we aren’t able to do this. However, if you are in the St. Louis area, you can make an appointment to visit our offices and make your own specially designed bracelet. 9. Can I have a bracelet made longer? How much does it cost? Yes, we do make extra-long bracelets upon request. These orders cannot be entered electronically, but must be ordered through the mail (see #1 of this section for instructions) and paid by check. Extra-long bracelets cost 15% more than the original bracelet. For example, if the brochure bracelet costs $20, the extra-long version of that bracelet would be $23. When ordering by mail, please include the additional amount in your check and indicate you are ordering an extra-long bracelet for the specific style number. Extra-long bracelet orders may take as much as six weeks to fill. 10. Can I buy a silver ribbon for a bracelet? Yes. The cost of a silver ribbon is $3. Go to the Charms section on the left side of this page to order ribbons. 11. I’m a retailer. What is the wholesale price on the bracelets? Everyone who sells Circle of Hope Bracelets is a volunteer. Bracelets are not sold to anyone at a wholesale price. 12. I live outside the United States? Can I buy the bracelets? Sorry, we are not set up to sell COHB bracelets outside the United States at this time. 13. What are the material components of the bracelet? The information on bracelet materials is described under the section All Bracelets and also under the detail on each bracelet. 14. How do I take care of my Circle of Hope Bracelets? 15. What is the overhead cost of the organization? We keep our costs very low. We have a small staff that organizes our volunteers, and the production, shipping and bookkeeping tasks. We receive many professional services – such as design, website construction and maintenance, legal and accounting services – through in-kind contributions to us. A major cost, of course, is the materials for the bracelets. 16. How can I help make bracelets? Most bracelets are made in the St. Louis area. We have a geographic limitation on this activity because of shipping and insurance costs, proper supervision, and quick turnaround time on materials. 17. As an individual how can I help sell bracelets? Many volunteers throughout the country have sold bracelets to others. For additional information on selling bracelets, email info@circleofhopebracelets.org. 18. Can I raise money for my favorite cancer charity through Circle of Hope Bracelets? You probably can. Please email info@circleofhopebracelets.org and ask for information on how to raise money for your favorite cancer charity. 19. What is your return policy on purchases? 20. Will you repair my bracelet? Yes, we do all repairs free of charge. Mail your bracelet to: Circle of Hope Bracelets, 460 North Lindbergh Blvd., Suite 201, St. Louis, MO 63141. Let us know the repair that needs to be made on the bracelet. Also include your name and address and we will mail the repaired bracelet to you. Repairs may take as long as five weeks. 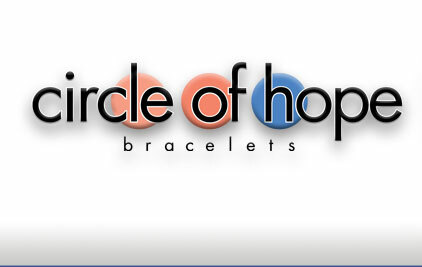 Circle of Hope® is a registered trademark of the Circle of Hope Bracelets.